The Internet of Things (IoT) is booming: the number of connected devices is expected to exceed the 60 billion threshold in 2016 and the IoT market is projected to generate $14.4 trillion in increased revenues and lower costs by 2022. The IoT's exponential growth is partly due to the plethora of industrial applications it offers, as well as the competitive advantages it may provide at a corporate level. Nonetheless, the IoT's diffusion will not just positively affect the private sector: according to a recent study it will also provide far-reaching environmental benefits. 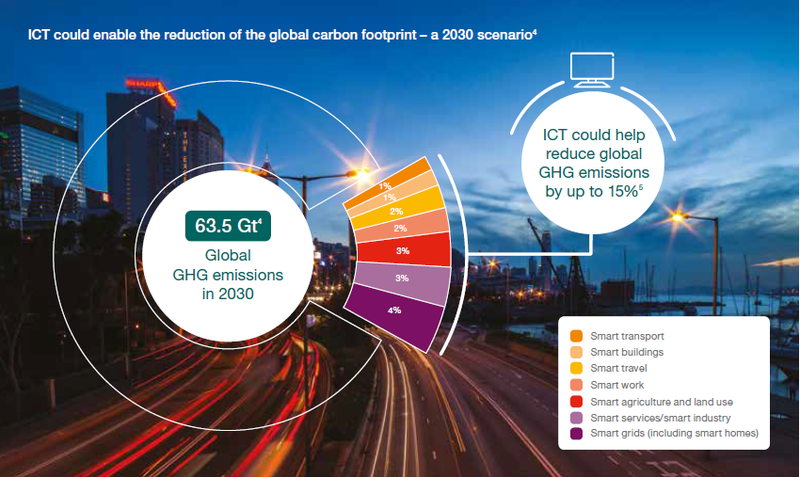 A recent report by Ericsson, in fact, claims that information and communication technologies (ICT) could help cut up to 63.5 Gt of GHG emissions by 2030. Furthermore, given the growing number of synergies the IoT creates between different industries, we could see for the first time a simultaneous reduction of industries' environmental footprint, thanks to energy savings and smarter solutions. Even more important is the fact that all those industries have the incentive to increase the adoption of IoT solutions, if they want to keep growing and stay competitive in the global arena. Therefore, the Internet of Things may well be considered a powerful ally in the fight against climate change, precisely at a time when global leaders advocate for more accessible, scalable and economically viable ways to protect our planet. 1. It will also involve less “bankable” sectors, such as forestry and biodiversity protection, which usually lack the financial resources needed to implement innovative solutions. Rainforest Connection, for instance, is a San Francisco-based start-up which transforms recycled cell phones into solar-powered listening devices attached to trees, that can monitor and detect illegal logging activities at great distance, thus promising to enhance the protection of deforestation-prone areas such as the Kalimantan region in Indonesia or the Amazon forest. Meanwhile, a 2015 video by the Wildlife Conservation Society shows how motion-sensing cameras may help scientists monitor the status of endangered species, while providing new tools to fight poaching activities. 2. It will immediately enhance the living conditions of low-income populations in developing countries, given their reliability on the agricultural sector, while also reducing the environmental footprint of agricultural activities. The International Telecommunication Union, in fact, has estimated that the number of households living in rural areas with internet and electricity access is constantly increasing, in parallel with mobile subscriptions. Even if substantial infrastructural and economic barriers remain, the progressive diffusion of sensors and connected devices may foster the implementation of innovative techniques, such as precision agriculture, which limits the use of pesticides, fertilizer and water to the very minimum, as well as weather forecasting systems, which are particularly relevant given the tremendous impact of extreme weather events, like droughts, on local people's well-being and income-generating opportunities. 3. It could create opportunities for new public-private partnerships. In the last few years, an increasing amount of public-private initiatives have adopted IoT solutions, ranging from smart grids to energy efficiency applications. The unprecedented growth of the urban population, meanwhile, highlights the importance of increased public-private cooperation in smart cities and the circular economy to deliver more scalable low-carbon development models. For example, IBM's China Research Lab is working with the Beijing Environmental Protection Bureau (BEPB) and other municipal authorities in China to scale-up its air quality forecasting system, as part of IBM's Green Horizons Initiative. The system uses pollution data from a network of sensors spread throughout Beijing. Through complex modeling and machine learning techniques, it returns increasingly precise forecasts of air pollution levels in different neighborhoods. The examples listed in this article show how widespread the future environmental benefits provided by the diffusion of IoT devices could be. Even if still limited in scale, IoT initiatives may soon become ubiquitous, generating game-changing dynamics in almost every business sector. Even more importantly, the rise of the IoT may provide for the first time the right incentives to rapidly accelerate a large-scale transition towards a low-carbon economy. IoT solutions, in fact, demonstrate how innovation may spur sustainability and resource efficiency, while also ensuring economic growth and profitability, and therefore it represents a valuable win-win solution whose real potential is yet to be fully understood. How much is the internet of things worth to the global economy?